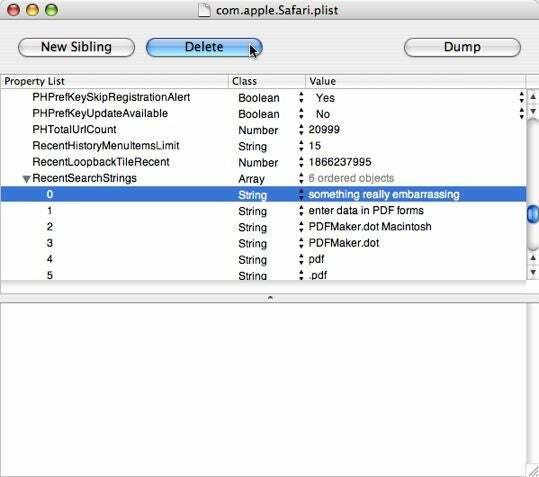 Using the Property List Editor from the Developer Tools, open ~/Library/Preferences/com.apple.Safari.plist, and you’ll find recent searches listed under the RecentSearchStrings property list. Just select each entry you’d like to remove and click Property List Editor’s Delete button. Close the window, click Save in the sheet that appears, and the entries you deleted will no longer appear among Safari’s recent Google searches. Pretty? Hardly. But I wanted a way and Peter provided it.